To start with, you need to have an account from UnicomNZ. Please visit their website to get a SIP account: www.unicomnz.co.nz. After you get the SIP trunk account, you need to add a SIP trunk in Yeastar Cloud PBX. Go to Settings > PBX > Trunks, click Add. In the new window, select New Zealand from the “Select Country” drop-down list and select UnicomNZ from the “ITSP”. Name: give this SIP trunk a name to help you identify it. Username: your UnicomNZ Account username. Authentication Name: the same as the username. From User: the same as the user name. Password: your UnicomNZ Account password. Caller ID Number: your UnicomNZ Account DID number. Click Save and Apply. Go to PBX Monitor to check if the SIP trunk is connected successfully as the screenshot below shows. 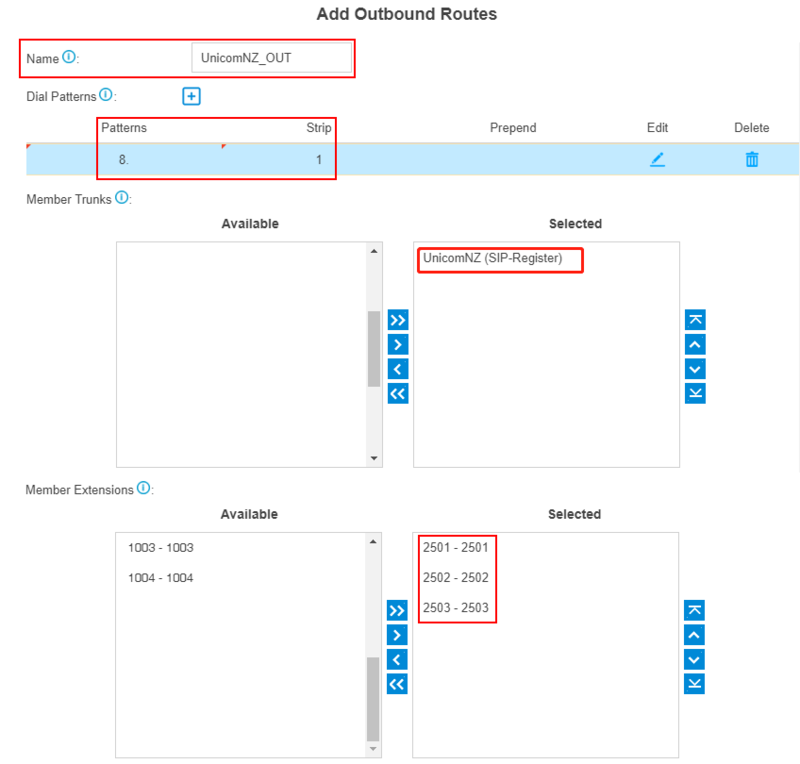 To make outbound calls via the newly created SIP trunk, you need to configure an outbound route for the trunk. Go to Settings > PBX > Call Control > Outbound Routes, click Add. The system compares the number with the pattern that you have defined in your route 1. If it matches, it will initiate the call using the selected trunks. If it does not, it will compare the number with the pattern you have defined in route 2 and so on. The outbound route which is in a higher position will be matched firstly. Route Name: give this outbound route a name to help you identify it. Dial Patterns: set the dial patterns. As the settings below, to make calls via the SIP trunk, you need to precede the number to be dialed with the prefix 8. Member Trunks: select the UnicomNZ trunk. 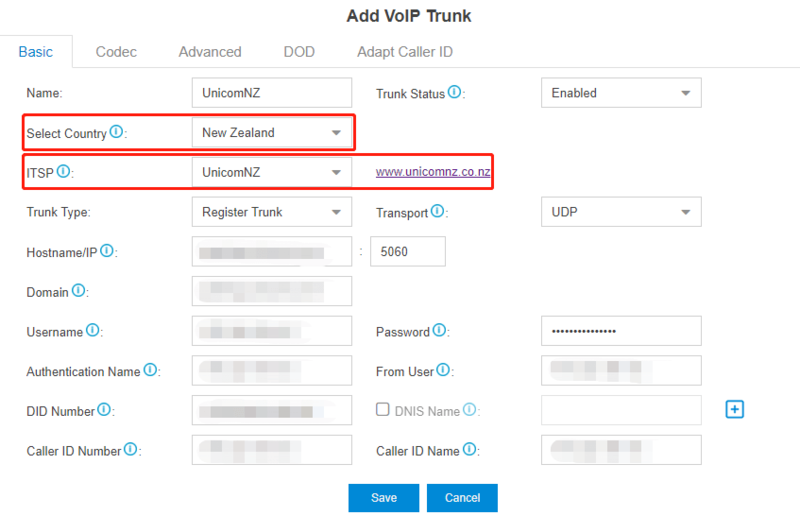 Now you can make outbound calls through the UnicomNZ trunk. As the dial patterns configured above, you need to dial “8” before the destination number. For example, to call the number “6401234567”, you need to dial “86401234567” on your phone. 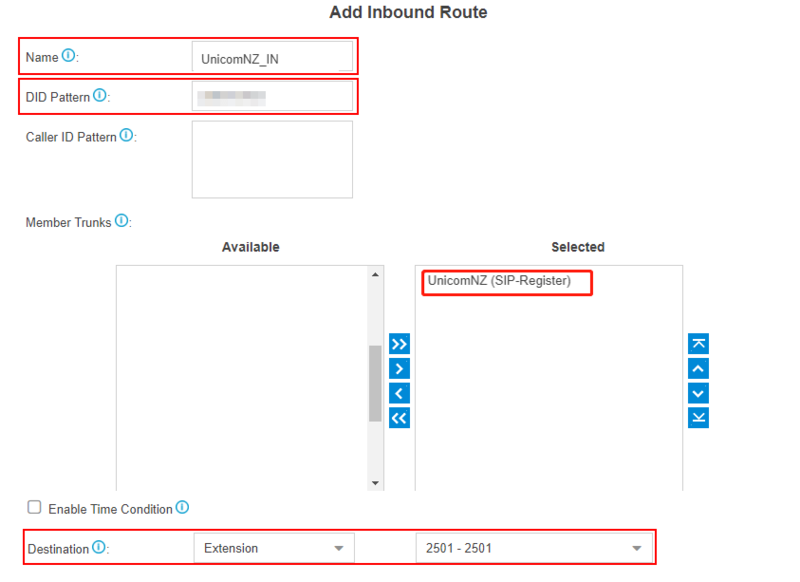 To specify how calls from the UnicomNZ trunk should be routed, you need to configure an inbound route for the SIP trunk. Go to Settings > PBX > Call Control > Inbound Routes, click Add. Name: give this inbound route a name to help you identify it. Member Trunks: choose the UnicomNZ trunk. Destination: select the destination where the incoming calls will be routed. When you call in the SIP trunk, the call will be routed to the destination configured on the inbound route.